This is Alan Aldridges famous double crown (20x30) poster for Andy Warhols art-house oddity. One of those posters that absolutely supercedes the source material as a piece of art. In excellent/near-mint, totally unrestored condition with just a short, closed tear in the bottom border of 2-3 inches. 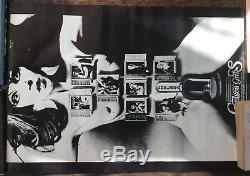 The item "Chelsea Girls vintage film cinema movie advertising Warhol quad art James Bond" is in sale since Thursday, February 7, 2019. This item is in the category "DVDs, Films & TV\Film Memorabilia\Posters\Originals - UK Quads\Pre-1970". The seller is "litho_lover" and is located in Wigan.